A permit obtained at the Garden entrance is required to access this trail which winds up through forest, crossing the stream several times and ending at a lovely waterfall. However if there has been a lot of rain, permission may not be granted as crossing the stream then becomes dangerous. Please note that keys to the gate will not be issued after 1:00 pm and must be returned by 4.00 pm. Keys are the property of the Harold Porter NBG. The deposit of R50.00 on the key is forfeited if keys are handed in late and this money is used to maintain the trail. Please remember to lock the gate behind you on both entering and leaving the kloof. At no time may the gate be left open. Once you have locked the gate behind you, the path rises for a short distance before dropping down to the first river crossing. Once across, and a little way ahead, the very observant may see the old scratch marks of a leopard (Panthera pardus) on one of the tree stems. This may explain how the kloof got its name! These animals are still seen at night in the area from time to time. Two more river crossings take you to the first waterfall. 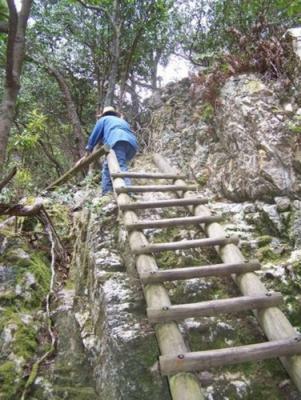 Then a series of ladders lead to the second and on to the third waterfall. The base of this waterfall is your final destination. Here in season (late December to end January) you will find the red disa (Disa uniflora) flowering in all its glory amongst the water spangled mosses and rocks of the cliffs towering above the pool. This is a wonderful place so give yourself time to stop and drink in the serenity of this special spot. Please keep to the path as this prevents trampling of plants, compaction of soil, and scuffing of tree roots which are all detrimental to the forest ecosystem. No swimming is allowed in the pools or elsewhere on the Garden estate. As in all natural areas take only pictures and leave only footprints. Enjoy your experience in Leopard’s Kloof and do come again!